New Name for Smith Street. The understanding among the members of council is that the fight for change in the name of Smith street from Whitehall street to Glenn street is not yet over. Representatives of the second ward declare that the residents of Smith street are determined to have a new name for their street, and will have another petition before council during the next session of that body. It will be remembered that it was the intention to change the name to Whitehall place, but it was discovered that one Whitehall place already exists, and this caused Mayor Howell to veto the measure. Residents of Smith street want the name changed for the reason that Smith street for a portion of its way is settled by negroes and runs through Pittsburg. The real estate men, headed by Forrest Adair, and the attorneys of Atlanta have been anxious to have council discontinue the habit of changing the names of streets. They have made a fight on Smith street. Councilman James E. Warren has in mind an ordinance which he may present during the next session of council. It provides that the name of Atlanta streets be changed only by a two-thirds vote of council. This, he believes, will have the effect of making a proposed change in the name of a street so difficult and important a matter that few will attempt it. Comments Off on New Name for Smith Street. Smith Street Must Keep Name. Mayor Howell announced yesterday morning that he would place his veto upon the resolution which changes to Whitehall place the name of Smith street from Whitehall to Glenn street. This he will do for the reason that there is already one Whitehall place in Atlanta. The city code shows that it runs from Brotherton to Fair street. The proposed change in the name of Smith street has attracted considerable attention, mainly because of the opposition of the real estate men and the members of the bar to the measure. Forrest Adair made speeches before both the street committee, of which Alderman Terry is chairman, and before council, but the members of both bodies disagreed with his views and voted to change the name of the thoroughfare. When the resolution went to Mayor Howell for his consideration Mr. Adair again appeared and presented arguments against the proposed change in the name of the street. 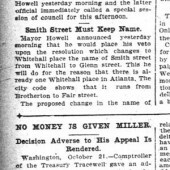 Mayor Howell announced that he would hear from the other side before reaching a decision, but before those who favor the change of name could be heard Secretary Goodwin discovered in the city code that there already exists a Whitehall place and he so informed the mayor yesterday morning which resulted in an immediate veto. Comments Off on Smith Street Must Keep Name. Proposed Change in the Name of Smith Street Was Discussed Before Him Yesterday. Arguments against changing the names of streets were heard yesterday morning by Mayor Howell. Forrest Adair, who appeared for the real estate men and attorneys of Atlanta, spoke against the custom. Representatives of the other side will be heard by the mayor whenever they desire. The speeches were based upon the measure which changes the name of Smith street, between Whitehall street and Glenn street, to Whitehall place. Mayor Howell has until next Thursday evening to decide whether he will approve or veto the measure. The resolution changing the name of the street was vigorously opposed by Mr. Adair both before the street committee and during the session of council, but notwithstanding his objections and despite the petitions from real estate men and members of the local bar, council voted to change the name of the street. Comments Off on MAYOR HEARD ARGUMENTS. The protest made by Mr. Forrest Adair to the city council yesterday against the frequent and often capricious changing of the names of streets in the city is deserving of that body. The value of certainty in the metes and bounds used in describing real estate grows in importance with the growth of the city. The activity of the real estate market is dependent in large measure upon the accuracy and permanency of such descriptions, the more so as the city fills up with new citizens. They are unacquainted with our old maps and the metamorphoses of local names. They look only to the chain of titles and, as Mr. Adair says, they frequently refuse a property because of the vagarious changes of the names of streets that occur in consecutive deeds. A yet greater reason why council should be slow to change the names of our thoroughfares is the fact that already the names of landmark streets have been changed, the honors paid to pioneer citizens obliterated and names that should have remained linked with localities and thoroughfares crossed off our map for fanciful and unsuggestive substitutes, in some cases these changes have almost amounted to a profanation of the fathers of the city. The names of former mayors, even of that one who heroically bore the interests of the city in the awful days of Sherman’s siege and occupancy, the noble James M. Calhoun, have been sacrificed for meaningless titles. 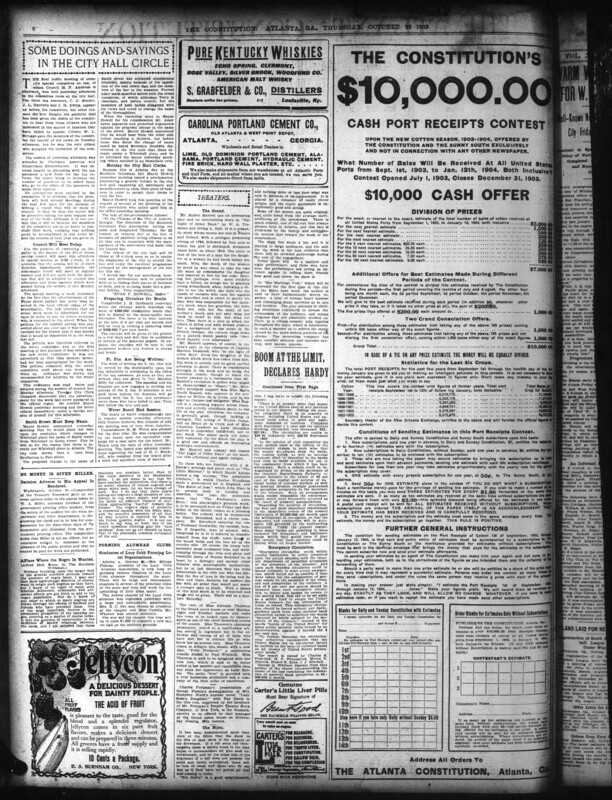 Change Whitehall street to “Commerce avenue,” Marietta street to “Bucephalus boulevard,” and Peachtree street to “Elite avenue,” and by those three simple substitutions that can be adopted in three minutes in council, the Atlanta of history and of common knowledge and pride throughout Georgia and the union will be obliterated. Patriotic and commercial reasons, especially the important one of making readable and acceptable titles to real estate, are plenty enough to cause council to deliberate long before it takes down the names of well-known streets to replace them with the tony and pride-tickling titles that have been invented without rhyme or reason. We trust the city is at the end of that sort of uncalled for vandalism. Comments Off on Changing Street Names. Was Changed to Whitehall Place by Council Yesterday. The name of Smith street, from Whitehall street to Glenn street, was Monday afternoon changed by council to Whitehall place and if Mayor Howell gives his approval to the measure it will become a law. 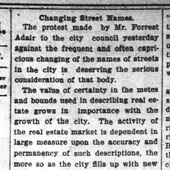 Forrest Adair, for the real estate men, spoke against the change of name, but the members of the body believed that the wishes of the residents of the street should be regarded. The report of the street committee, which was favorable in changing the name of Smith street to Whitehall place, having been read, the privilege of the floor was extended to Forrest Adair, who spoke against the custom of changing the names of the streets. A number of real estate men and attorneys were present. “Before final action is taken on the report of the street committee to change the name of Smith street to Whitehall place I desire to present certain facts taken from the record in reference to the custom or habit into which the council has fallen of making such changes. “In doing this I wish to distinctly disclaim any desire to personally oppose any of the residents of that street. I am interested in the ownership of property on the street, and will aid them in any movement that may lead to its improvement. “I have prepared from the records a list which I herewith present to you, showing that four hundred and forty-seven changes have been made in the names of streets, several of them having borne as many as eight different names. 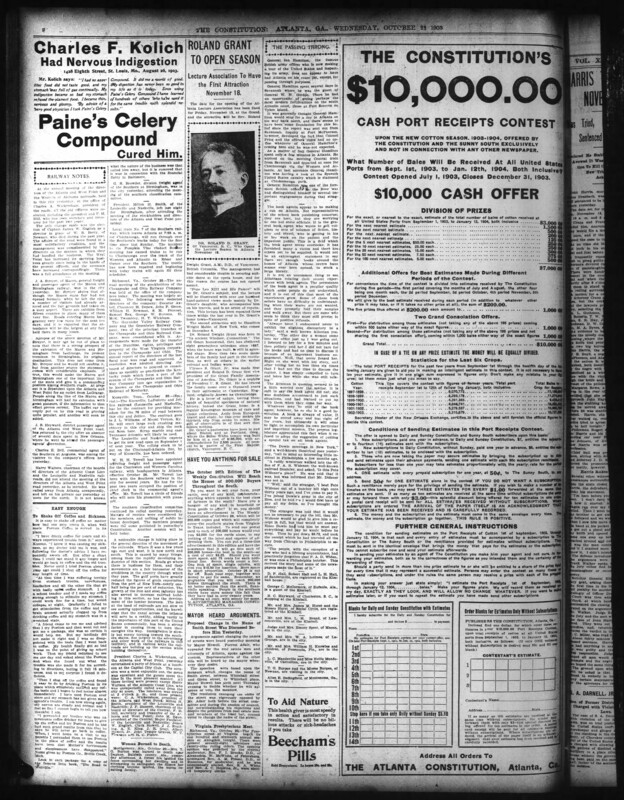 “This causes serious trouble and inconvenience to the real estate agents, attorneys and to the property owners themselves in trading titles when real estate is sold, it being well nigh impossible to convince one from the record of the correct identity of the lot so variously described. 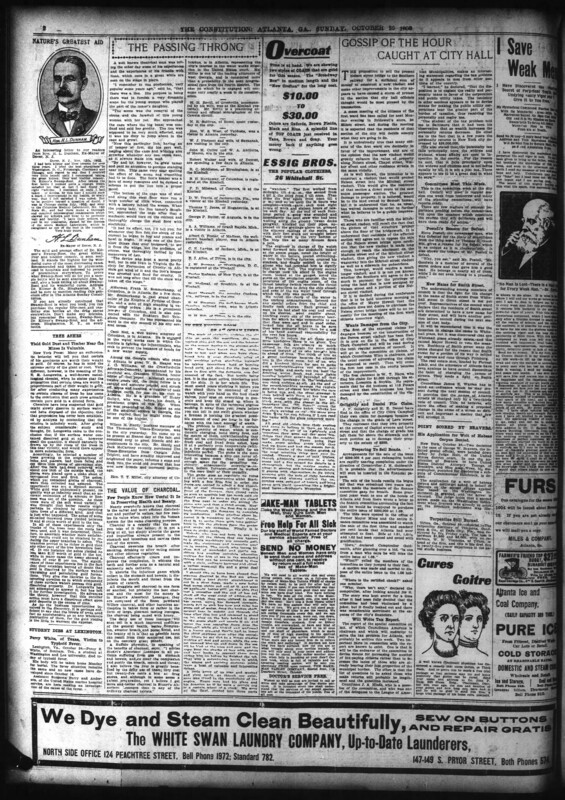 “My firm has just sold a piece of property on the corner of Walton street and Tabernacle place, and the deed of the present owner describes it as being on the corner of Walton and Harris streets, while the next deed in the chain of title describes it as being on the corner of Foundry street. I have actually known of titles being rejected on account of the doubt as to identity. “How many of you gentlemen of the city council can now direct a stranger to the six Peachtree streets? We have the one peerless Peachtree, and in addition, West Peachtree, Peachtree place, West Peachtree place, Peachtree road and East Peachtree terrace, which, however, has recently been changed back to its original name, because no one can find it. “Smith, the street now under consideraytion, has been variously known as Stephen, South, Simpson, Newman and Gate City. “This street was named for an honored pioneer citizen, Mr. Windsor Smith, who, in the ante-vellum days, together with the Colliers, Jones, Loyd, Calhoun, Joseph Thompson, Richard Peters and others, were by their brain, industry and enterprise helping Marthasville to discard her swaddling clothes, thereby making this great city of Atlanta a possibility. “In 1861, just as the darkness and gloom of a civil war appeared on the horizon, Mr. Smith died, and ten years later his friends and neighbors, who knew of his value and worth to the community, paid to his memory a tribute by giving one of the cities arteries of trade his name. “The others were in like manner honored by those who thought it fitting to in some way carry down to after generations the names of the fathers of our beloved city. “One by one, and for no good reason, in order to gratify the whim of the residents, whose minds are as vacillating as the winds, you have ruthlessly taken away this honor and shattered the only monuments to many of them. “Calhoun was changed to Piedmont and absolutely no benefit has been derived therefrom. “Loyd to Central avenue, and lots on that street bring no more per front foot. “Collins to Courtland, and yet Maison de Joie still flourish furnishing superior facilities for our sons to prostitute their persons, debauch their souls and cut each other down in midnight drunken brawls. “You robbed Joseph Thompson, the father of Mrs. Richard Peters, Mrs. Thomas M. Clarke, Joseph and Edgar Thompson, of the tribute paid to him because, by your permissions, the street had become disreputable. “A rose by any other name would smell as sweet,” and Madison avenue today with its cess pools and slimy sewers of men’s passions, its supurating sores, its reeking ulcers on the social body, emits its stinking odors as high toward the heavens as Thompson street ever did. “If our only monuments of marble and bronze, erected to Hill and Grady, were to become damaged or discolored, would you change their names or cleanse them? In all respect to you gentlemen, I say that your duty was to remove the stain from the streets rather than efface the tribute to the memory of the grand men who had been thus honored. “In West End, near my home, are two streets named for the two heroes, Lee and Gordon, and on the north side, Forrest avenue, named for the recklessly valiant genius, whose name I am proud to bear. “A councilman who would even suggest a change of these names would bring down upon himself the condemnation of his constituents, and the resolution if read in this chamber would be drowned with hisses. 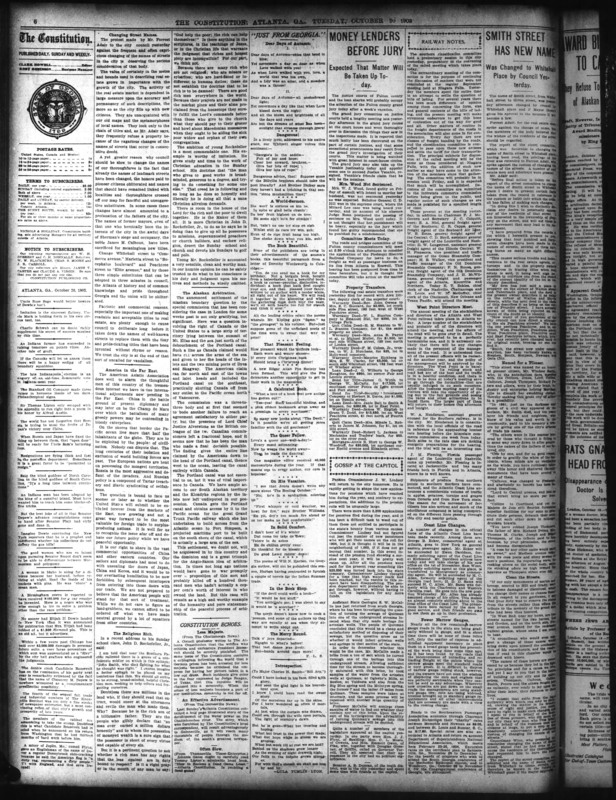 “The names of these heroes are reverenced by us because they led in the fight for principles and for a cause we love and yet I say to you that in the battle of building up our city and its enterprises, Thompson, Calhoun, Colliers, Smith, Peters and others fought just as valiantly, ever ready to lay upon the altar their labor, their fortunes or their lives. 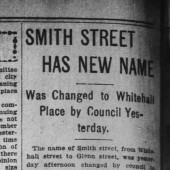 Councilman Winn, who presented the resolution changing the name of Smith street, stated that he had done so because the residents of the thoroughfare had requested him to have the name changed. The report of the street committee was adopted and the name of Smith street from Whitehall to Glenn streets, will therefore be known in the future as Whitehall place if the mayor approves. Startling State of Affairs Brought to Attention of Councilmen. Evidence of Proposed Change in Name of Smith Street, Which Is Favorably Recommended by Street Committee. 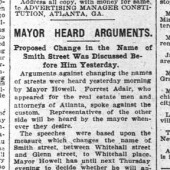 The fact that more than 225 streets of Atlanta have had from two to eight names, resulting in confusion and trouble to the real estate agents and the attorneys, was brought to the attention of the street committee of council, of which Alderman Terry is chairman, yesterday afternoon by Forrest Adair, who introduced this evidence in opposing the proposed change in name of Smith street to Whitehall place. Petitions from fifty-eight members of the bar and from twenty-one real estate dealers were presented to the committee by Mr. Adair at the same time he offered a list of those streets whose names have been changed. 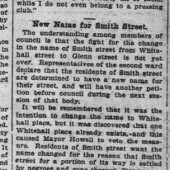 Notwithstanding the statements of Mr. Adair and the petition from attorneys and real estate men the committee decided to again recommend that the name of Smith street be changed. The matter now goes to council, where it will be acted upon during the session next Monday afternoon. Residents of the street desire the change in name. In opposing the proposed change in the name of the street Mr. Adair state that in many instances titles had become so confused as a result of the constant change in the names of streets that parties now claim land that is in no manner described by their deeds. Parties who desired to sell their land and those who desired borrowing money on their property often found it impossible to attain these ends because of the changes that had been made in the names of the streets. In addition to this, he said, there is no index to the records of the city, and as a consequence it is with much difficulty that the identity of the present streets is established. Abbott street, formerly D’Alvigny street. North avenue, formerly Emma street. Lindsay street, formerly Norrall street. Drew street, formerly Oliver street. English avenue, formerly Milledge avenue, Riley street. Raine avenue, formerly Franklin street. Julian street, formerly Jackson street. Elm street, formerly Goddard street, Eisle street. Chestnut street, formerly Travis street. Lucile avenue, formerly Porter avenue, Pearl street. Oak street, formerly Amos street. Rossmer street, formerly Alexander street. Culberson street, formerly Pearl street. Gordon street, formerly Villa Rica road. Oglethorpe avenue, formerly Baugh street. Grady place, formerly Jean street. Whitehall street, formerly Railroad avenue, Peachtree street. McPherson avenue, formerly Murphy street. Mitchell street, formerly Gray street, Stockton street. Parsons street, formerly South street. Fair street, formerly Stephens street, Holcombe street. Boaz street, formerly Bowie street. Brown street, formerly Broomhead street. Ficken street, formerly Battle street. Tyler street, formerly Henry street. Thurmond street, formerly Spencer street, Turman, Brickyard street. Carter street, formerly Jack, Jett and Caster streets. Hunter street, formerly Mayson & Turner’s ferry road, Battle Hill avenue. Ashby street, formerly fairground street. Granger street, formerly Herbert street. Sunset avenue, formerly Arthur street, Elm street. Burckel street, formerly Beasel street. Humphries street, formerly Sumter street. Smith street, formerly Gate City street. Ira street, formerly Crowell street, Haven street. Stewart avenue, formerly Vine, Humphries, Kreis streets, New Whitehall road, Ocmulgee. Hobson avenue, formerly Philips street. Cherry street, formerly Mathews street. Evans street, formerly Blanche, Garner streets. Benjamin street, formerly James street. West End avenue, formerly Thrasher street. Park street, formerly Salter street. Georgia avenue, formerly Andrews, Bass, Anderson, Sharp streets. Dodd avenue, formerly Dora avenue, Dodd street. Love street, formerly Lane street. Atlanta avenue, formerly Gardner Park avenue, Cottingham, Harden, and Montgomery streets, Benning. Ormond street, formerly Orman, Ormewood streets. Doane street, formerly Davis, Dorne, Daniel streets. Formwalt street, formerly Pulliam, Fourteenth streets. Pryor street, formerly Depot streets, Line street. Central avenue, formerly Bass, Loyd, Lott streets. Pulliam street, formerly Sullivan street, Loyd streets. Washington street, formerly Collins street. Capitol avenue, formerly McDonough street. Sixth street, formerly Seventh street. Fifth street, formerly Sixth, Moore and Hill streets. Spring street, formerly Pear street. Fourth street, formerly Keith street. Marietta street, formerly Montgomery, Ferry road, Payne street. Tifton street, formerly South street. Berne street, formerly Little Switzerland ave.
Ormewood avenue, formerly Park avenue. Cloverdale street, formerly Robinson avenue. Rawlins street, formerly Herren, Dora streets. McCreary street, formerly McCrary street. University avenue, formerly South street or avenue, Oakland avenue. Ridge street, formerly East Pryor and McDaniel streets. McDonough street, formerly Ridge avenue. Fortress avenue, formerly Tudor street. Crew street, formerly Morris avenue, Ann street, South avenue. Pavillion street, formerly Anderson street. Bass street, formerly Love street. South avenue, formerly George street. Kent street, formerly New street. Park avenue, formerly George street. Austin avenue, formerly Moreland avenue. Lawshe street, formerly Dallas street. Emerson street, formerly Sycamore street. Meredith street, formerly May street. Woodward avenue, formerly Chatham street and Jones. Kolb street, formerly Old Flat Shoals road. New Flat Shoals road, formerly Glynn, Glenn streets. Wylie street, formerly Tennelle, Wyly, Lee, Hulsey street, Flat Shoals road. Marcus street, formerly Wallace street. Kirkwood avenue, formerly Waterhouse street. Harold street, formerly Jefferson street. Gaskell street, formerly Elswald, East Hunter streets. Boulevard Factory street, formerly Borne, Seavy streets. Cornelia streets, formerly Lane, Love streets. Ella street, formerly Ellner, Ellen streets. Gunby street, formerly Wilson street. Berean avenue, formerly Mills, Langford, Badger streets. Powell street, formerly Cameron avenue, Borne street. Estoria street, formerly New street. South Delta place, formerly Oak, Lee, Wylie, Hulsey streets. Williams mill road, formerly Distillery, Durand, Decatur roads. Copenhill avenue, formerly Haygood avenue. Lake avenue, formerly Forrest avenue, Forrest street, Decatur turnpike. Euclid avenue, formerly Turnpike road, Atlanta and Stone Mountain pike road. Augusta avenue, formerly Ponce de Leon avenue, Love street. Smith street, formerly Stephens, South, Simpson, Gate City, Newman streets. McDaniel street, formerly McDonough street. Windsor street, formerly McDonough, Weser, Nelson streets. East avenue, formerly Morris street. Kendall street, formerly Magnum, Mayson, Morgan streets. Shelton street, formerly Mayson street, Shelton alley. Highland avenue, formerly east Harris street, East Hightower avenue. Houston street, formerly Randolph street. Ashland avenue, formerly General Gordon, Gordon avenue. Auburn avenue, formerly Wheat street. Edgewood avenue, formerly Foster, Forest streets. Gospero street, formerly Gospero, Glaspero streets. Randolph street, formerly Calloway street, Martins alley. Fortune street, formerly Fortress, Fontaine streets. Sampson street, formerly Simpson, Fontaine streets. Krog street, formerly Wallace street. Waddell street, formerly Wolfes avenue. Hale street, formerly Joel Hurt, Oglethorpe streets. Nelson street, formerly Bridge street. Walker street, formerly Hayden, Collier, New Whitehall streets. Bradberry street, formerly Wilkins alley. Peters street, formerly Old Whitehall street, Newman. Tattnall, formerly Nelson Ferry road, Trebussey street. Larkin street, formerly Davis street. Whitehall street, formerly Mitchell, Franklin streets. Orange street, formerly Quarry street, Cozarts alley. Rawson street, formerly High street, Faiths alley. Richardson street, formerly Henry, Richmond streets. Crumley street, formerly Connalley street, Mobbs alley. Gregg street, formerly Brown’s alley. Hood street, formerly Windsor street. Spruce street, formerly Magazine street. Foundry street, formerly Mechanic, King streets. Magnolia street, formerly Magnum, Gabbott, Magazine, Foundry and West Cain streets. Rhodes street, formerly Richards street. Vine street, formerly Price, Erin streets. Maple street, formerly Porter, Proctor, Loyd, Rock, Love, Howe, Law, Back streets. Davis street, formerly Chattahoochee, Larkin, Rock, Delay, Front streets. Elliott street, formerly Elbert, Ellis, Fowler streets. Haynes street, formerly Manning, Harris, Booths alley, Hayden street, Markham and Stewart streets. High street, formerly East Parsons street. Chapel street, formerly Racetrack, Atherson, Greensferry road. Bartow street, formerly Foundry alley. Forsyth street, formerly Wadley, Gilber streets. Broad street, formerly Market, Bridge street. Harris street, formerly Howard street. Baltimore place, formerly Hunnicutt avenue. Price street, formerly Jones street. Mills street, formerly Hunnicutt street. Powers street, formerly Tannery street. Fowler street, formerly Fulton street. Orme street, formerly Eliza street. Walnut street, formerly Green street. Simpson street, formerly Henry street. Henry street, formerly Ella, Tyler, Ellaby, Rock streets. Rock street, formerly Beck, Racetrack streets. Mayes street, formerly Delay, Brickyard, Doray streets. Decatur street, formerly Marietta, Pearce, Shipley streets. Wall street, formerly Railroad street. Waverly place, formerly New street. Trinity avenue, formerly Peters street. Brotherton street, formerly Branch alley. Capitol place, formerly Crew street. Spencer avenue, formerly Thompson street, Madison avenue. Peachtree street, formerly Whitehall street. Capitol square, formerly Mitchell street. Poplar street, formerly Grubb street. Luckie street, formerly Grubb, Miller streets. Earl street, formerly Harris, Latimer streets. Warren place, formerly Perkins, Barnes streets. Gilmer street, formerly Taylor, Filmore streets. Central place, formerly Butler street. Courtland avenue, formerly Collins street. Piedmont avenue, formerly Calhoun, Catherine streets. Frazier street, formerly Cravens alley. King street, formerly Foundry street. Moore street, formerly Henry, Haynes, Pine streets. Bell street, formerly Hill street. Eugenia street, formerly Clarks street. Pine street, formerly Line street. Currier street, formerly Spring street. Forrest avenue, formerly Oslin, Austin, Dorsey streets. West Peachtree street, formerly Luckie, Dahlonega streets, Payne alley. Alexander street, formerly Tanyard, Clark, Cedar, Peters streets. Peachtree street, formerly Ivy, Oak streets. Butler street, formerly Ripley street. Edgewood avenue, formerly Foster, Trout, Pitts, Line streets. Bell street, formerly Valentine street. Vernon place, formerly Chestnut street. Tanner street, formerly Pratt, Fair streets. College street, formerly Coca-Cola place. Armstrong street, formerly Walnut, Jenkins streets. Angler avenue, formerly Brumby, Nolan streets. Rice street, formerly Spring street. Chestnut avenue, formerly East avenue, Morris street. Nutting street, formerly Pearl street. Jackson street, formerly North, Randolph, Chase, Antoinette, Julian streets. Boulevard, formerly Rolling Mill, Burnham. Jefferson, Foundry streets, East, Pittman avenues. Borne, Factory streets. Eighth street, formerly Walker street. Ponce de Leon avenue, formerly Ponce de Leon circle. Burnham road, formerly Pittman avenue, Rolling Mill street. North avenue, formerly Peters, Lane, Johnson, Emma, Holmes streets. Linden avenue, formerly Fulton, Ravine, Mayer, Cox streets. Merretts avenue, formerly Dairy, Mills, Glazier streets. Oakland avenue, formerly Elmore, Gullatt, Stonewall streets. Yonge street, formerly Krogs, New street. Fitzgerald street, formerly Goodhue street. Howell street, formerly Buices, Buses alley, Bass street, Howland avenue. Cain street, formerly Willoughby street. Fort street, formerly Tanyard, Wooding streets. Hilliard street, formerly Floyd, Loyd, Boyd, Young, Washington, Randolph, Packard, Madison streets. Hogue street, formerly Pegg street. Nemo street, formerly Orleans street. Milledge avenue, Hansell, Dabnev street. Cherokee avenue, formerly Thomas street. Horton street, formerly Houghton street. George street, formerly Gray street. Forsyth street, formerly Gilbert, Wadley streets. Columbus avenue, formerly Mule street. West avenue, formerly Rhodes street. Carnegie place, formerly Church street. East Peachtree terrace, formerly Powers street. Bynum street, formerly Parks street. Newport avenue, formerly Milledge avenue. D’Alvigny street, formerly Abbott street. Latimore street, West Baker street.